According to Organ Needles, sewing machine needles should be regularly replaced because worn out needles can cause fabric damage. Blunt or bent needles can produce skipped stitches and even thread breakages - extreme cases can also result in machine damage. Universal: Regular round point needle for general sewing of fabrics such as suede, courduroy and linen. Super Stretch: Medium ball point needle, for low-gauge fabrics such as simplex, latex, Lycra, general sportswear and elastics. These needles protect against skipped stitches with a specially formed scarf that stabilizes loop formation and gives enough clearance to the rotating hook to ensure the loops are caught securely. 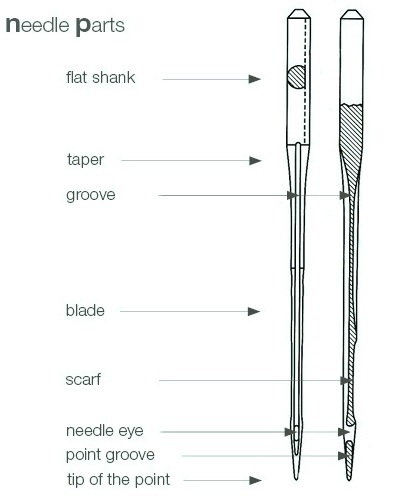 A thickened eye section enlarges the penetration area whilst the medium ball point protects the fabric. Microtex: Slim sharp point needle, for micro fabrics such as batiste, chiffon and lace. The sharp point reduces penetration resistance to help prevent needle and thread breakages. The high density matrial is also protected from puckering. Jersey: Medium ball point needles, for general knitted fabrics such as jersey and fleece. Jeans: Slim ball point needle for denim, canvas, coated fabrics, flannel etc - reduces penetration resistance to protect against needle and thread breakage. Leather: Narrow, twist point needle for leather and suede. With its unique, knife-shaped point, the needle delivers stable-sized needle holes and aesthetically desirable, angled stitches. Embroidery: Light ball point needle, for multi-directional sewing. Embroidery means sewing in multiple directions and there will be much movement and twisting of the thread, which could result in thread damage and/or skipped stitches. 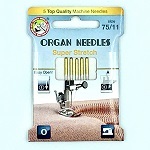 Equipped with a larger needle eye, these needles enable use of thicker embroidery thread. A cliff scarf helps more stable and larger loop formation and the light ball point avoids thread and fabric damage.